Beirut, 24 Dec. (AKI) – Syria’s Greek Orthodox patriarch has made a fresh appeal for the release of a group of nuns and two bishops being held by kidnappers in the war-wracked country. “We will not stay silent over the abduction of our bishops and any other innocent people,” Youhanna X Yazigi said in a Christmas message cited by Lebanon’s Daily Star newspaper on Tuesday. He was referring to Greek Orthodox bishop Boulos Yaziji and his Syrian Orthodox colleague Yohanna Ibrahim, who were both seized at gunpoint outside the northern Syrian city of Aleppo on 22 April. 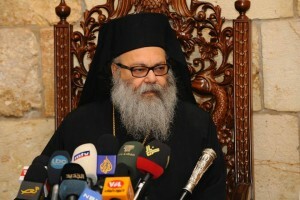 Yazigi also called for the release of a dozen nuns kidnapped from the Orthodox Monastery of Saint Tecla in the historic Christian village of Maalula north of Damascus on 2 December, after it was reportedly overrun by rebels. ”We also cannot remain silent over the capture of the messengers of peace – I refer to the nuns of Maalula,” added Yazigi. “We must all raise our voices against their abductors,” he added. At his general audience in St Peter’s Square, on 4 December, Pope Francis appealed for the nuns and all hostages being held in Syria to be freed.